Communications issued by El Salvador's largest gangs this weekend declare that the gangs have decided to relaunch the truce process which started in March 2012, but seemed to have largely fallen apart two years later. The Constitutional Chamber of El Salvador's Supreme Court continues to issue rulings which increase the ability of citizens to participate in the democracy and lessen the power of party leadership. In a unanimous ruling by all five judges on Tuesday, the Chamber held that El Salvador's Law of Political Parties is unconstitutional for failing to include provisions requiring transparency in the finances of the political parties and in failing to require representative democracy in party's internal elections to choose leaders and candidates for office. The National Assembly will now have two months to amend the Law of Political Parties to comply with the Chamber's ruling. The ruling will not affect the choice of candidates for the March 2015 elections, however. 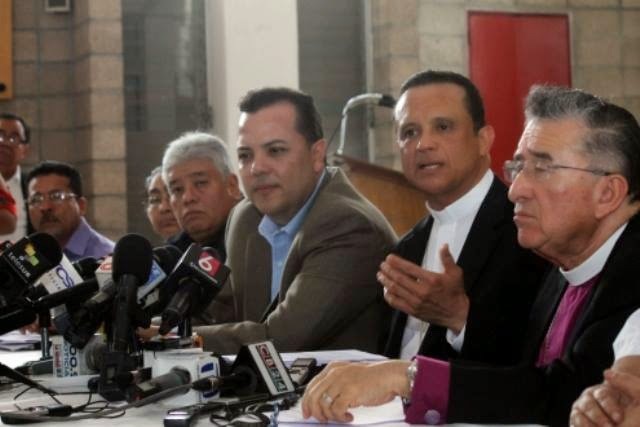 A group of churches in El Salvador yesterday made public their proposals to the government for working on the problem of gang-fueled violence in El Salvador. Calling itself "IPAZ," the Pastoral Initiative for Life and Peace, the group of Protestant and Catholic churches propose a "tridimensional dialogue" between the churches, the gangs and civil society to seek an understanding for a reduction in the levels of violence and homicides. IPAZ proposes to be the facilitator of this process. The church leaders do not describe this process as a continuation of the so-called truce process, but instead an attempt to rescue those pieces of that process which had produced positive results. They expressed a certainty that there were various gang members who truly did want to give up lives of crime. IPAZ stands opposed to those who would say there can be no dialogue with the gangs. El Salvador held close and polarizing presidential elections in March; now the country is heading into the campaign season for mayors of every municipality and for deputies in the National Assembly. The elections will be held on March 1, 2015. Already a couple of races look interesting. 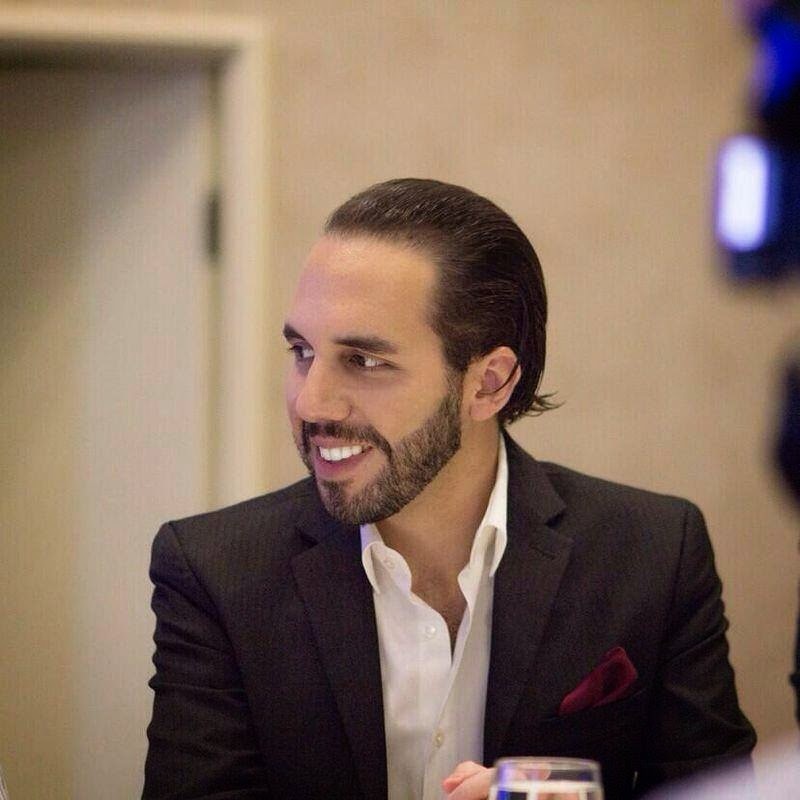 The FMLN announced that its candidate for may of San Salvador will be Nayib Bukele, the popular 33 year old mayor of Nuevo Cuscatlan. Bukele will be competing against current San Salvador mayor Norman Quijano who will be running for a third term after his unsuccessful presidential bid. Also announced as a candidate is Walter Araujo, a former member of ARENA who quit the party and will now run under the GANA banner. 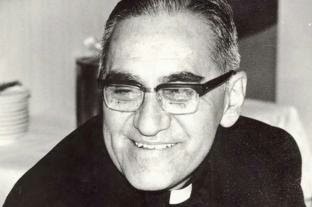 Francis: "Romero is a man of God"Pope Francis has spoken explicitly for the first time about his desire to see the beatification of Archbishop Oscar A. Romero of El Salvador, saying that, “For me, Romero is a man of God” and stating that there are no more doctrinal problems standing in the way of the martyred prelate’s beatification. “It is important to do it quickly,” the Pontiff added. Artist Fernando Llort is a national treasure in El Salvador, and he continues to give back to his homeland. On Friday in San Marcos, El Salvador, artist Fernando Llort and a group of youth began work on a mural titled "The Jewel of Hope and Peace." The project is sponsored by UNICEF, as part of its campaign "no te indigna?" / "aren't you outraged?" which is intended to raise awareness of violence afflicting children in the country. Llort's recent works in public spaces have included a renovation of the Monument Hermano Lejano ("Distant Brother") dedicated to those Salvadorans living abroad. The renovation, concluded in 2012 includes sculptures and murals to provide a "fraternal hug" and a welcome home. 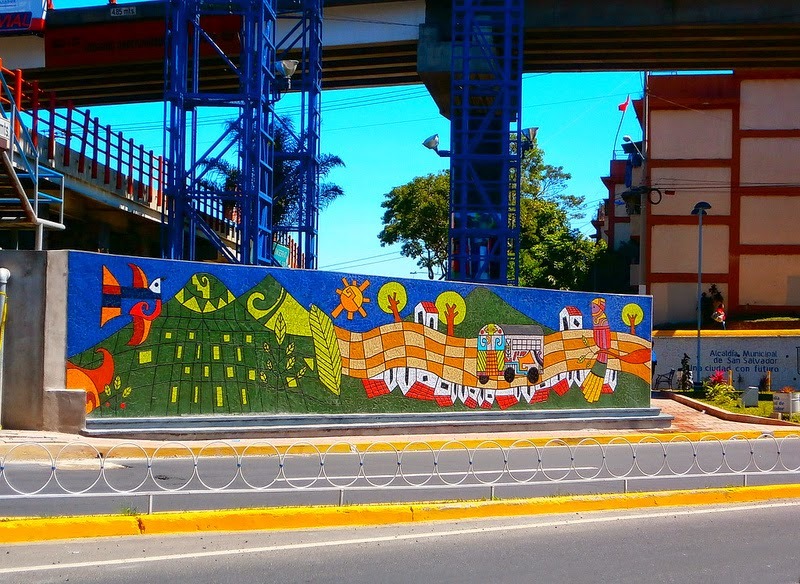 He also recently completed a mural with youth volunteers in Santa Tecla as part of a Plan El Salvador program. You can see everything this prolific artist is up to at the Facebook page of the Fundación Fernando Llort. Who will protect the innocent victims of gang violence? This week saw some very good feature length reporting in The Nation and The New Republic regarding the gangs in El Salvador and the reasons people flee the country for the US. Today on the front page of the Ministry of Education website, the government was featuring for download this popular version of the history of the 1981 Massacre at El Mozote titled El Mozote: Lucha por la verdad y la justicia -- El Mozote: The struggle for truth and justice. The book was published by Tutela Legal, the (former) human rights office of the archdiocese of San Salvador, and is illustrated by drawings from the organization for popular education known as Equipo Maiz. It is a small step, and yet an important step, to encourage the telling of the actual history of El Salvador's civil war in its schools. The government of president Salvador Sanchez Ceren launched a community policing initiative today as part of its strategy for combating the high levels of crime and violence in the country. The initiative which seeks to create strategic relationships between the police and the communities where they are working, will start in 42 sectors around the historic center of San Salvador. The plan will be extended to other areas of the country in coming months. The government also announced the deployment of more police on motorcycles as well as video monitoring of sectors of central San Salvador. The community policing initiative represents the first piece of a security policy which we have seen from the new president. I think community policing is part of the solution which El Salvador needs, but it will require significant effort and change from a police force most notable for the size and number of guns each of its officers carries. Environmentalists from the "On the Heritage Route" project recently stopped at El Salvador's El Impossible National Park. The work of the Heritage Route project is to discover and share (by bicycle) local initiatives reconciling development and conservation of natural and cultural heritages. They document their visit in a blog post titled Last Untouched Lands Protection in El Salvador – Not Impossible for SalvaNatura!. The national park is managed by SalvaNatura, a non-profit environmental organization in El Salvador. Figures from El Salvador's Central Reserve Bank show that remittances sent by Salvadorans living abroad to their relatives in the country are set to exceed $4 billion this year. The amount of remittances has been growing annually since a significant drop in 2009 during the Great Recession. To put these numbers in context, family remittances equal approximately one sixth of the country's gross domestic product. $4 billion in remittances would represent more than $2000 per person for each of the roughly two million Salvadorans living in the exterior. 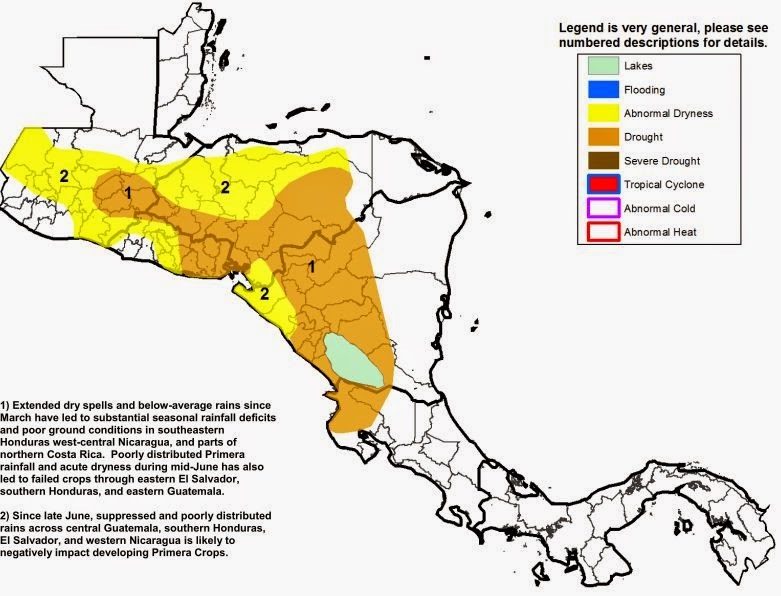 The drought has swept across a region known as "the dry corridor," which covers nearly a third of Central America, where 10 million people live, according to a 2013 study by the U.N. Food and Agriculture Organization. Source. El Salvador has lost 10% of its corn harvest so far and other crops such as beans and coffee have been impacted. 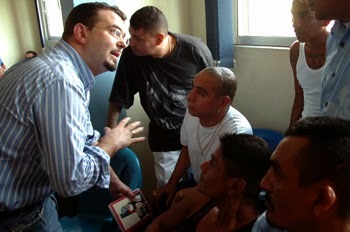 After less than a half day of freedom earlier this week, Padre Toño, the Spanish priest known for his work with gang members in his parish in Mejicanos outside of San Salvador ended up back in detention. The Salvadoran prosecutors added new, more detailed charges, and persuaded a judge to return the cleric to provisional detention. The arrest of Spanish priest Father Antonio Rodriguez in El Salvador, better known as Padre Toño, has prompted surprise and protests, spreading all the way to Spain. According to the World Bank, El Salvador has some of the lowest taxes in all of Latin America and the Caribbean, and these revenues are not sufficient to finance needed spending on social programs.